Glance at the Luleå Archipelago on a map and you might be faced with an unassuming little spatter of green against the blue strip that separates Sweden from Finland. In reality, it’s a collection of over 1,300 islands spilling from the mainland into the Bay of Bothnia. Wildlife-loving kids and parents will absolutely love it here: the waters are home to sociable seals that peek out and say hello; the rocks and cliffs are inhabited by a staggering variety of Northern and Eastern European birds like white-tailed eagles and red-throated divers. Well worth exploring! Sat on the mainland overlooking all of this is Brändön Lodge, our much-loved accommodation used on all of our family holidays to this location, close to the town of the same name. The main building is a lovely log structure surrounded by fifteen cosy cabins where you can relax after a fun-filled day out. 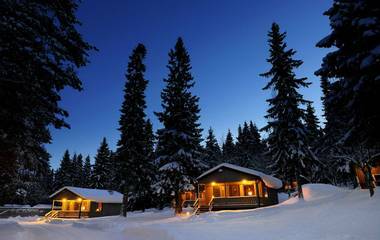 Speaking of things to do, you won’t lose time in lengthy transfers: the lodge is right in the middle of activity country, with everything from boat tours to snowmobiling trips departing nearby. When there are so many islands to be seen, you don’t want to be trundling around in a boat – pleasant as that may be. We’ve arranged something much zippier which will get you around in true sci-fi style: a hovercraft! Piloted by an expert, it will take you out into the bay, where you can stop off at islands and get watching wintry fauna or admiring natural sculptures made of ice. It’ll feel like you’re zooming over the surface of a new planet in a galaxy far, far away! We’re sure you’ll all be eager to head through the white landscapes of the wilderness close to the lodge. What better than a winter skills session on snowshoes? A seasoned guide will have you picking up the essential tricks needed to survive in these parts – you’ll soon be learning how to make a fire from scratch and identify animal tracks. In a separate session, you travel to a frozen body of water to try out the traditional art of ice fishing. It’s immensely rewarding to make a catch! It will also be possible to travel around on dogsleds and snowmobiles, neither of which are you able to genuinely experience back home. Both are simply superb ways to enjoy the outdoors. 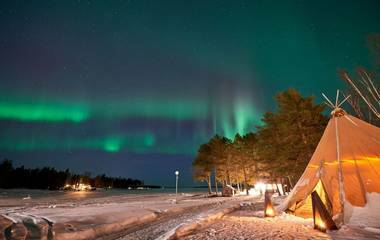 Of course, you’ll also be able to attempt spotting the Northern Lights, which light up the skies above at night. 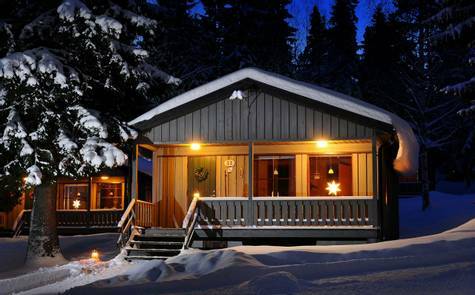 You’ll feel very comfortable in Brändön: the cabins are like spacious family cottages with all facilities that you might require. The staff are wonderful people – indeed, it can easily be said that while Brändön’s total population is only around 300, the whole of this small community makes up for its size many times with an immensely open and welcoming environment. You’ll find friends wherever you turn! Now, it’s risky for us to mention the hovercraft again, because we will just go on about it. It’s just so much fun – and also something very new for most families. 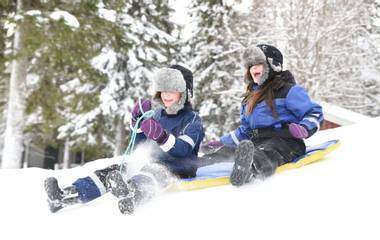 The same can be said of dog sledding, which is consistently rated as one of our most popular activities. Children and parents quickly connect with the huskies; during the ride, you rapidly begin to appreciate that this everyday method of getting around in the Nordic countries carries a wealth of history too. The bond between human and dog in these parts has lasted for centuries. Whether you’ve been out ice-fishing or learning the ways of the wilderness, there’s nothing like a hot meal to fill you up afterwards. Open-fire cooking is a speciality here which you’ll certainly be able to sample; the lodge restaurant also serves up some gorgeous regional dishes like Swedish fish soup, which make a hearty end to the day.